Pity Ötzi, The Iceman, circa 3500BC. It is believed that he was involved in copper smelting as both copper particles and arsenic, a trace element in some copper ores, were found in his hair. Not only was he being slowly poisoned by the arsenic, but to smelt the copper he had to achieve a wood fire temperature of about 1085ºC (1985ºF), as discussed in my last post. The arsenic in the copper did have a benefit, as it gave the copper a little more strength than if it were pure. Shortly after Otzi’s time, metal workers discovered that adding 10% tin to the copper produced bronze. Bronze is not only markedly harder than copper, but it melts at almost 100ºC lower than pure copper, making metal working much easier. The Bronze Age had begun. This period coincided with what scholars would recognize as the beginning of modern civilizations, such as those in Egypt and Greece. Since it melts at a lower temperature, bronze also fills molds better. This improved mold filling is evident in Figure 1. This photo shows a copper and bronze hatchet that I had made. 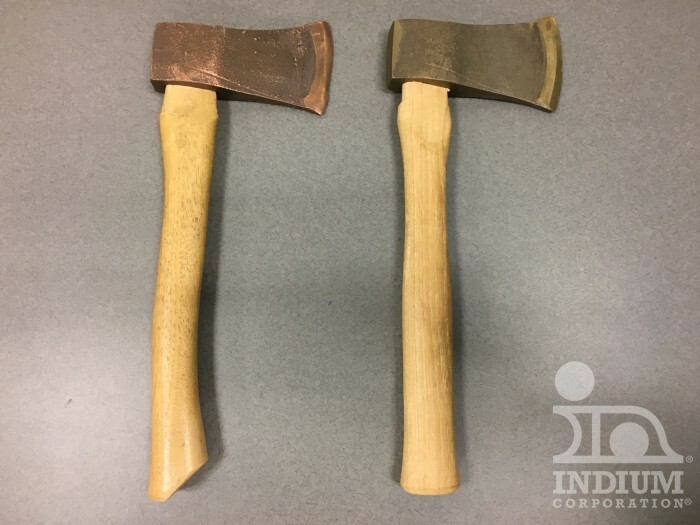 The copper hatchet on the left shows evidence of poor mold filling. Figure 1. Copper, on the left, and bronze hatchets that were made for Dr. Ron’s Dartmouth College course ENGS 3: Materials: The Substance of Civilization. Note that the copper hatchet shows poor mold filling due to copper's higher melting temperature. In my opinion, it is almost certain that the Bronze Age is related to the development of soldering. The first evidence of soldering was about 3000ºBC where, arguably the first civilization, the Sumerians assembled their swords with high temperature solders. Since the base metal for most copper-to-copper soldering is tin, the early metal workers almost certainly learned that tin could be used to join copper or bronze pieces together at much lower temperatures than smelting. Until the European Union’s restrictions on lead in solders in 2006, most electronics solders were tin-lead eutectic. 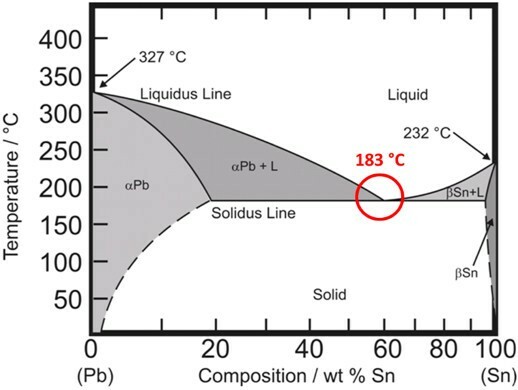 Eutectic is a Greek word that roughly translates into “easy melting.” Figure 2 shows the tin-lead phase diagram. Note that the melting point of tin is 232ºC and that of lead is 327ºC, yet at the eutectic concentration of 63% tin/37% lead, the melting temperature drops to 183ºC. This concentration and temperature is known as the eutectic point. Figure 2. The tin-lead phase diagram. Note the eutectic point at 183ºC. Although the eutectic point is an interesting and usually beneficial phenomenon due to its lower melting point, the true miracle of soldering is that two pieces of copper that melt at 1085ºC can be bonded together with a tin-based solder at less than 232ºC. The value of this benefit cannot be overstated. Nature has allowed us to mechanically and electrically bond two pieces of copper together at a low enough temperature that we can do this bonding in the presence of electrically insulating polymer materials. Without this feature of solder, we would not have the electronics industry! An added benefit is that the bonding is reworkable, so that if a component fails, it can be replaced without scrapping the entire electronics printed circuit board. It is natural to ask how this bonding takes place. The tin in the solder forms intermetallics with the copper. 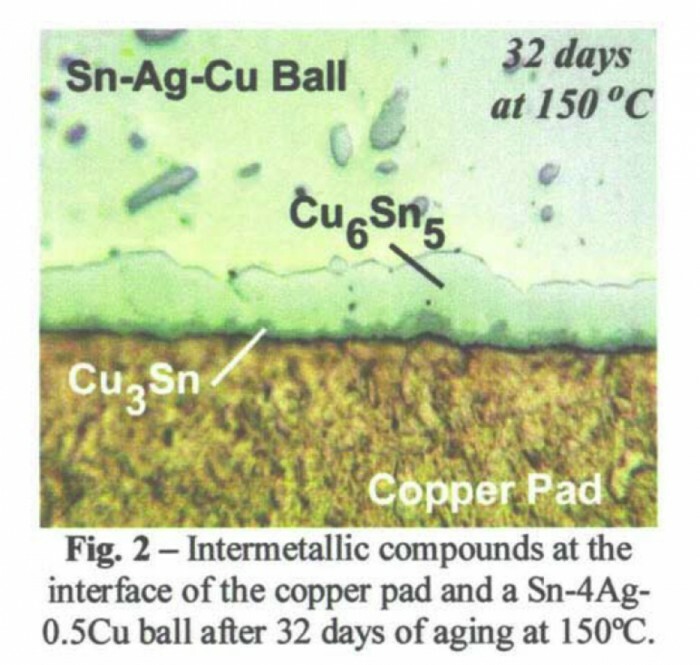 Typically Cu6Sn5 forms near the tin and Cu3Sn forms near the copper. See Figure 3. Figure 3. Copper tin intermetallics from Roubaud et al, "Impact of IM Growth on the Mech. Strength of Pb-Free Assemblies," APEX 2001. So next time you use your smartphone, laptop, tablet, or other electronics device, don’t forget that without the miracle of soldering it wouldn’t exist.